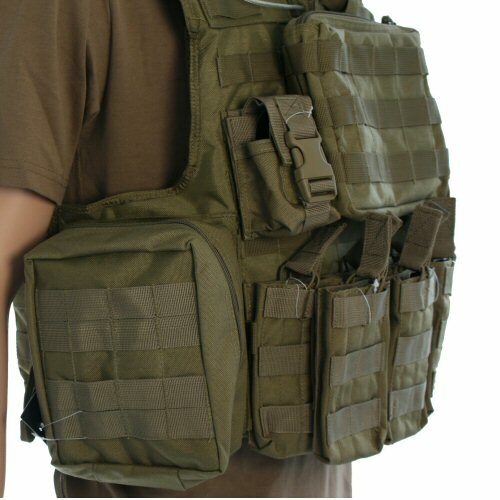 The Bulle MOLLE armour carrier with pouches in tan is a full sized Releasable Armour Carrier Vest (RACV) based system with modular storage for 7 M4 NATO magazines in the front, together with a multifunction medical kit pouch, water bottle or utility pouch, two small utility or grenade pouches and one large zip pouch for extra chest plate or admin items. The armour carrier covers front and back with space for large soft armour panels within and plate pocket for 12x14in plates front and rear. 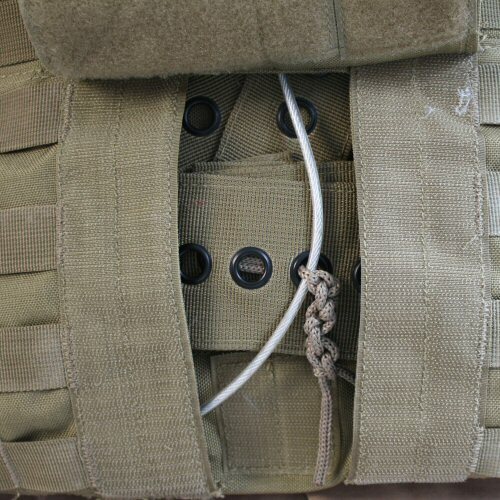 A cable operated release runs from the rear of the vest, over the shoulder and into the quick relase panel located on the front of the vest. 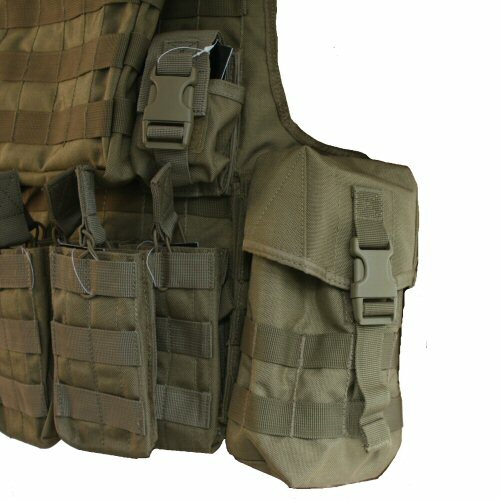 Shoulders feature cable covering flaps that protect the vest cable from accidental release and can also be used to shield comms and hydration leads. The vest fastens around the waist with double velcro panels which are fitted with elastic to enable easier movement. 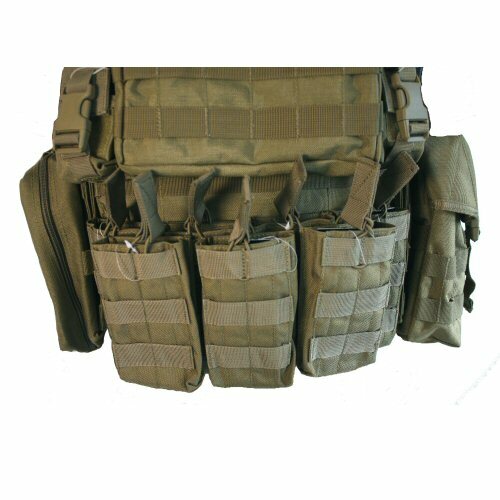 Stress points, such as the vest side opening panels, are all bar tacked for reinforcement as are the uppermost and lowest MOLLE straps. MOLLE attachment points are triple stitched throughout the base vest allowing the pouches to be detached and reattached to suit the wearer. 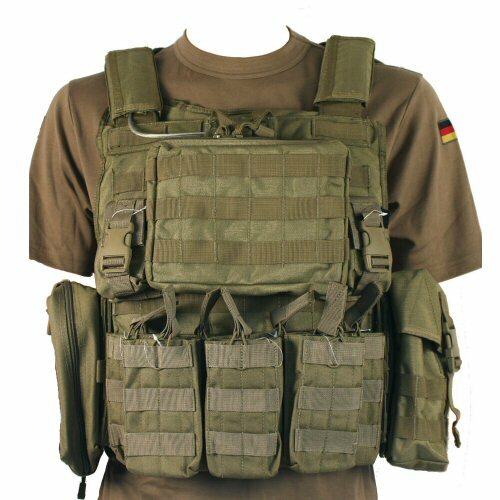 Vest comes with the following pouches: 1x large MOLLE zip bag capable of carrying extra 8x6in plate over the chest (or admin items if not being armoured), 2 frag grenade pouches with adjustable height lids, 7 shingle pouches suitable for one NATO M4 magazine in each, medical kit pouch with multiple pockets inside, nalgene water bottle pouch. All pouches can be detached and moved around as they are all compatible with any 25mm MOLLE system, as is the rig. All buckles and clasps are from Duraflex's military specification Stealth warrior range, rig and pouches are made from 1000D PU coated Cordura. Suitable for 38in chest to 46in chest, 5'7 to 6'0 height. Angled side view showing the medical kit pouch and the shingled arrangement of the magazine pouches. This allows each tab to be located separately of the next so there is no need to visually check which magazine pocket is being opened. Another view of the magazine pockets in the shingled formation. Each tab is easy to find and operate. The side of the vest showing the nalgene water bottle pouch. 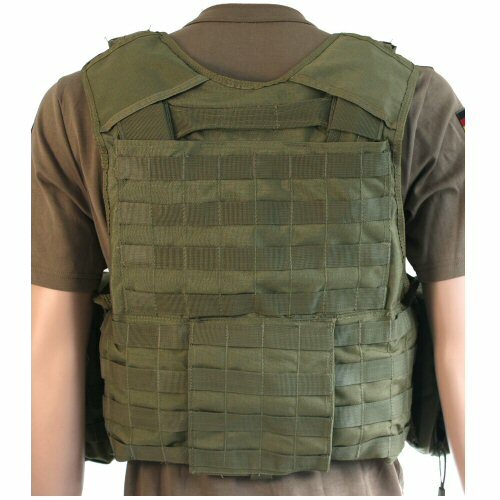 The rear of the vest showing the carry handle, MOLLE on rear and the lower black flap which conceals the size adjustment area. The lower back flap raised to show how the cable release joins all the parts of the vest together and how they are adjusted for size.